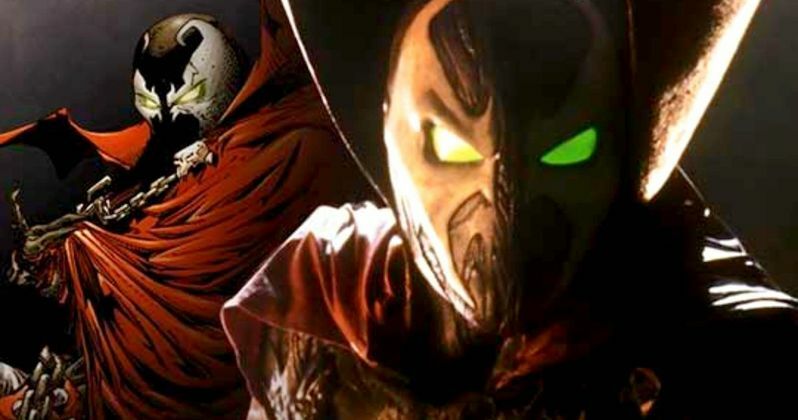 To celebrate the holiday weekend, Spawn creator Todd McFarlane has shared a page from the script of the upcoming remake and promised some big news that will be coming soon. It was recently revealed that the new, low-budget Spawn movie will take place in New York, but shooting will take place in another area that offers incentives for filming there, giving McFarlane a way to stretch his meager budget and get more bang for his buck. Spawn is currently in pre-production with shooting expected to start in February of next year. Keeping with the rest of information that Todd McFarlane has shared thus far, the page from the script features Twitch having a conversation with another character. McFarlane revealed over the summer that Spawn would not be the main focus of the new movie, but instead, he'll be in the shadows, much like Jaws, leaving Twitch to be the main focus of the movie. Maximilian "Twitch" Williams is the fictional NYPD homicide detective created by McFarlane and a pivotal character in the comics, being both an enemy and ally to Spawn. As far as the big news that Todd McFarlane has teased, it's anybody's guess. But, it seems likely that some casting news is in order, especially if the project stays on track to start production in February. No actors have been confirmed as of this writing and details regarding the plot are still being kept under wraps, although we now know that the movie will take place in New York City, the home of Twitch. Other guesses could be about Kevin Smith's long-awaited TV show with Sam and Twitch. At this point, it's anyone's guess, but Todd McFarlane has done an excellent job keeping fans informed as well as teasing little bits of information. After many years in limbo, Todd McFarlane is finally getting to write and direct his new Spawn movie, which will be his directorial debut. The outspoken comic book creator has been pitching the low-budget horror-style movie for years and aims to have a budget within the $10-12 million range that puts two NYPD detectives following a case that leads them to encounter a shadowy monster lurking on the peripherals of their investigation, much like Jaws. Since we're going to see some NYPD detectives, many fans have begun to get curious as to what actor will carry the new movie. Todd McFarlane is ramping up to get his new Spawn movie off of the ground to erase the painful memories that surround the original 1997 feature-length Spawn movie that came out to terrible reviews from critics and fans. One of the biggest voices of negativity was Todd McFarlane, so we'll see if he's able to pull of the Spawn project that he's been promising for so many years. While we wait to see what the new Spawn has in store for us, go check out the new picture from the script, courtesy of Todd McFarlane's Twitter account below.